My family moved to Anchorage in February 1966 when I was 13 in 2 station wagons, a camping trailer, 4 kids a dog and two cats. Both cats were great rabbit hunters accustomed to North Carolina woods but not so much to snow. We didn't worry particularly about the Seal Point Siamese but we feared the long-hair white Persian might be difficult to spot in the snow if she ever did escape the car. The practical solution my dad used was to dip the tip of her tail in mercurochrome, giving her a florescent pink flag you could see for quite a way. Traveling on the Alcan in winter is a pretty good way to go. Rocks and gravel, and the bane of summertime drivers, were completely absent, as were mosquitoes. As long as the temperature stayed below 20 degrees F, traction was pretty decent. Twice we did manage to tuck a vehicle into a snowbank at the side of the road---not a summertime problem---and were pulled by semi drivers, each time the very first to come upon us. This same spirit was to be found in our new home, as well, at least before the pipeline boom. You simply could not pull off to the side of the Seward Highway in winter to admire the view but the next car along would slow, roll down their window and make sure you were OK before moving on. One particular day on our way north we stopped for gas. Two cars roll up. Adults and a mess of kids spill out headed for the bathroom. The proprietor was a crusty old fellow, not given to saying more than "yes," "no" and "$26.37." Coop up 4 kids for days on end and a pit stop is apt to unleash more concentrated energy than the old-timer likely cared for. At last, the doors all open, kids and adults pile in, doors slam and off we went, for about 20 feet. Cars stop, doors fly open, Adults and kids spill out again. The hunt is on! After about 10 minutes, the proprietor leans out his door. "Loose sum-um?" My mom explained we were looking for "a white cat in the snow" and one of my siblings pipes up "with a pink tail." All we heard from from our friend was the slamming of his door and that story has been a staple of family lore for 50 years. The cat, incidentally, was eventually discovered napping under one of the seats and lived to a ripe old age of 18. What a great way to keep tabs on a white cat in the snow! Now I'll have to tell my story about a couple of our birds. Join in and write your own page! It's easy to do. How? 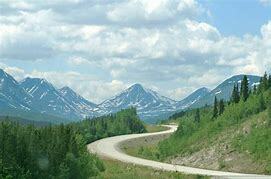 Simply click here to return to Alcan Highway.